It's particularly good timing that a drama dealing with the 2008 financial crisis should come out now, as thousands of protesters gather not only on Wall Street, but in cities across the world to protest unfair business practices by multinational corporations and corporate bankers. 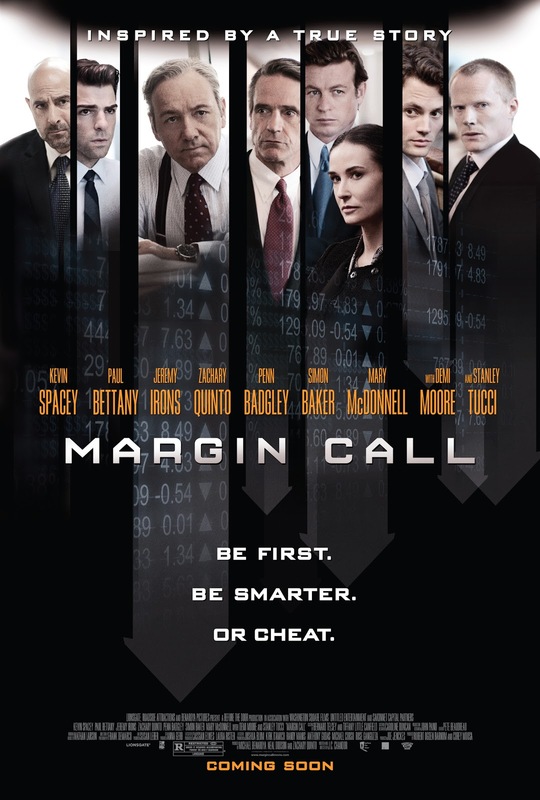 J.C. Chandor's new film, Margin Call, examines the roots of the financial crisis from the point of view of those who were on the front lines, in the hallways and boardrooms of a never-named corporation based in New York City. The film begins with a scene that has become an all too familiar one in this day and age. Eric Dale (Stanley Tucci), is brought into an office to be informed that his position has been cut after 19 years of service with the company, along with the majority of the other positions on his floor. He is given his severance package, and told that he must leave the premises immediately, and that his access to the building and cell phone were revoked effective immediately. Before he leaves, he hands a flash-drive containing his current project to Peter Sullivan (Zachary Quinto), one of his hotshot young employees, and asks him to take a look at it, with the cryptic warning, "be careful." 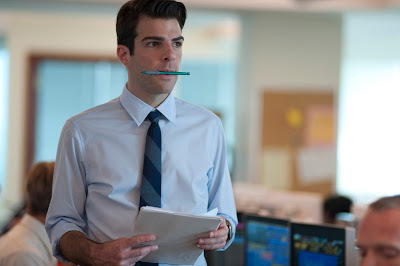 Zachary Quinto as Peter Sullivan in MARGIN CALL, written and directed by J.C. Chandor. When Sullivan puts together the data and crunches the numbers, he realizes why his superior told him to be careful, and he goes to his bosses, Will Emerson (Paul Bettany) and Sam Rogers (Kevin Spacey) who understand the magnitude of the data before them. The formula that traders have used for years is no longer valid, and that if trading continues to go over a certain point, then the losses to the company will be more than the company is worth. And it's not just them, it's global. After an emergency session with the executive board (including Simon Baker and Demi Moore), the CEO (Jeremy Irons) is called in, and makes a desperate decision in the name of self-preservation that will seal the fate of the impending economic collapse. Clearly the cast is the selling point here, and indeed it is a staggering ensemble. I just wish the film around them had been more deserving of their talents. 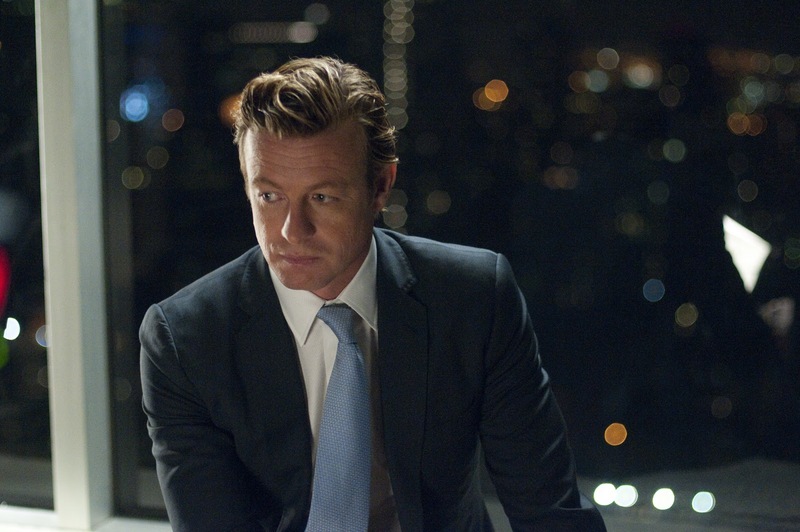 Margin Call is billed as a thriller, but it's really anything but. It's bland and wordy and relies too much on complicated financial jargon to tell its story. Irons' CEO instructs Sullivan at one point to describe to him the situation to him as he would a child or a dog (a clear attempt at simplification for the audience's sake), but the ins and outs of the situation remain frustratingly obtuse and abstract. 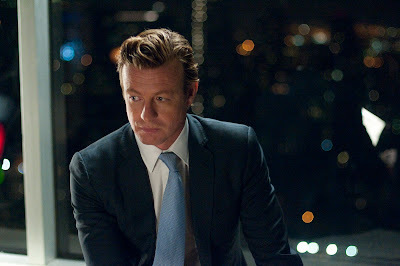 Simon Baker as Jared Cohen in MARGIN CALL , written and directed by J.C. Chandor. Chandor wrote the script in a matter of days, and it shows. He never infuses the film with the drama or tension one feels that a crisis of this magnitude requires. Instead it remains strangely cold and distant, despite the best efforts of a more than capable cast. There's just no real human angle here (other than a strange subplot involving Spacey's dying dog). Sure, it's timely, but that doesn't mean it has anything particularly new or profound to say about the crisis that hasn't been said more eloquently or more dramatically elsewhere. Whether one agrees with the Occupy Wall Street protesters or not, it would have been nice to have seen some of that passion in the film. Even with its mostly even handed approach it remains mostly dry and clinical, lacking in fire and directorial spark. It feels like a rush job, a forgettable TV movie with an amazing cast. It's a surface film, a fictionalized account of a true story that hits all the historical points but forgets that its characters are human rather than pieces of a historical puzzle. 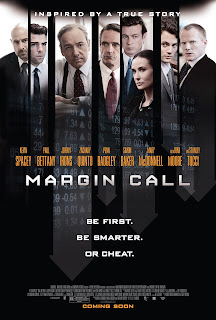 There is a great film to be found somewhere in this financial crisis, but Margin Call isn't it. MARGIN CALL | Directed by J.C. Chandor | Stars Kevin Spacey, Paul Bettany, Jeremy Irons, Zachary Quinto, Penn Badgley, Simon Baker, Mary McDonnell, Demi Moore, Stanley Tucci | Rated R for language | Opens Friday, October 21 in select theaters and On Demand.